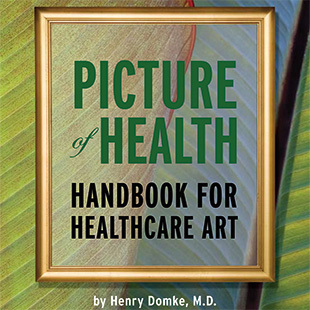 However, I am frequently asked: How do canvas prints hold up in a busy hospital environment? What happens when the cleaning staff wipes them with a wet cloth? How will canvas prints tolerate children with peanut butter and jelly on their fingers touching them? The answer is: if they have a protective coating applied, they should do just fine. Over the last several years I have sold hundreds of canvas prints and they have held up fine. But I'm always looking for ways to improve things. One problem with the protective coating I had been using is that it had to be applied after the canvas was stretched, otherwise it would crack. That meant passing on that job to the frame shops. Now I have discovered a coating that can be applied by me before I ship the prints, before the prints are stretched. I've testing this varnish and it is amazingly tough; almost bulletproof. I've tested my prints by scrubbing them with soapy rags and by trying to scratch them with a kitchen fork. The prints came through just fine. However, to apply the spray I had to build a spray room. A spray room is a sealed room with a strong exhaust fan and good lights. The picture above is me in the spray room today. Great spray room! It seems like a good idea for you to have control of varnishing your own photos. Thanks again for the wonderful tour of your property last week. Even though I picked up a few ticks, I really enjoyed seeing how you work and learning from you! It was great to have you here last week! Sorry about the ticks, one of the occupational hazards for nature photographers in Missouri. So don’t keep us in the dark! what kind of spray are you using? The spray I am using is called Glamour II. It is made by Breathing Color. I experimented with others, but this one looked the best and at the same time offered great protection. I blend it 70% Matte/30% Glossy. The canvas I have decided to use is called “Epson Premium Canvas Matte”. I tried others, but this on has a luscious surface that holds more detail than others. The reason it holds more detail is that it has less “tooth”. They are VERY good to deal with. I’ve been using Eco-Print Shield with ok results, but I’m glad to see that there’s something else I can try. I’ve heard other good things about Glamour II. I too feel that canvas is the way to go for healthcare. However, those that follow the peachtree venue seem to want everything under glass. Also the issue of the healthcare carts that damage the canvases through their day to day use…..dem sharp corners can do some damage. Mounting the canvases on a sturdy back still does not stop that real menance from doing damage. However, point can be made for works behind glass…….plexi is usually substituted in these more detrimental areas. I have been exploring posibilities of other surfaces that might be more advantageous for healthcare prints. The search continues. Thanks for your magic and help, Doc Henry. I am interested in this discussion of canvas in hospitals. I am wondering about issues of bacteria – especially in oncology. Because of infection control, works must be under plex or glass. That means canvas goes under plex boxes. My solution is to print art on the second surface of plexiglass or glass which allows for a very interesting installation. But plex scratches. So it is challenging. I am interested in this topic of infection control. And what artists are doing for this solution. I did another post that deals with this question. It is called “Does Art spread Superbugs?” and was posted August 13th, 2008. Bottom line: It is not an issue. I know it’s been several years since this post, so I was wondering if you are still using Glamour II to spray, or have you found something you like even better? We were not satisfied with Glamour II. I responded to your other post with more details.